Cloning is commonly used to amplify DNA fragments containing whole genes, but it can also be used to amplify any DNA sequence such as promoters, non-coding sequences and randomly fragmented DNA. It is used in a wide array of biological experiments and practical applications ranging from genetic fingerprinting to large scale protein production. We offer clones ready to use and a wide variety of cloning systems, including novel transcription-free cloning vectors, that improve cloning yields, reduce cloning bias, and improve sequencing throughput. Choose from our genome-wide collection of the ready-to-use clones or let us make your customized clones by gene synthesis. IDT and SGI-DNA have partnered to offer custom gene synthesis. Synthetic gene products manufactured by IDT and SGI-DNA can be ordered through the IDT website, allowing researchers to save money spent on construction and cloning, and saving significant time and effort by outsourcing the production of hard-to-clone sequences that often result in repeated failures. All genes are constructed using the highest quality oligonucleotides from IDT. 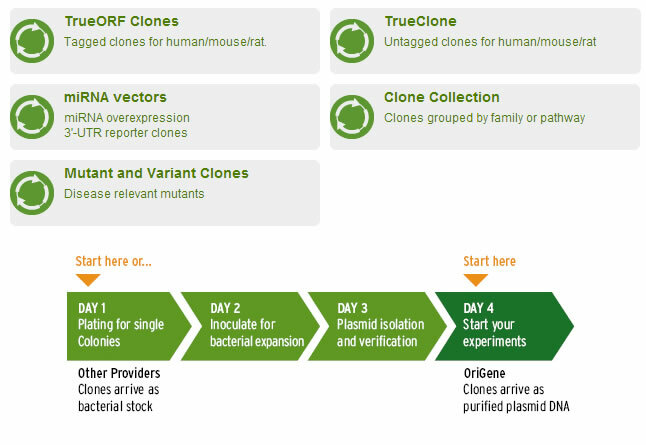 Genes arrive in a plasmid cloning vector and are ready for use in a variety of applications. 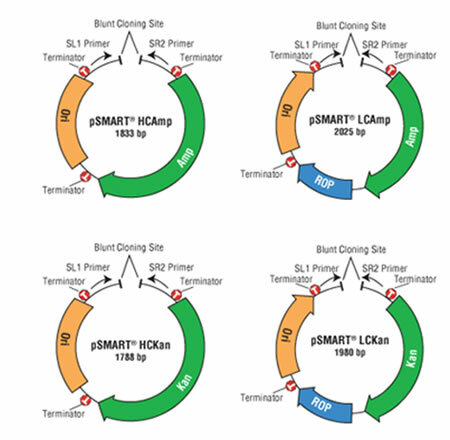 Gene sequences with added complexity (such as homopolymeric runs, critical hairpin structures or G/C content), which can interfere with assembly and/or sequencing performance may result in extra service charges. For more information about potential types of complexity, please see the Overview tab. SGI-DNA is a subsidiary of Synthetic Genomics, Inc. (SGI), specializing in development, manufacturing, and commercialization of synthetic DNA. The IDT partnership with SGI-DNA will uniquely enable the research community by providing a complete solution from short genes to very large synthetic constructs with an unprecedented, fast delivery time. gBlocks® Gene Fragments are double-stranded, sequence-verified genomic blocks up to 2000 bp in length that can be shipped in 4–7 working days for affordable and easy gene construction or modification. With gBlocks Gene Fragments, IDT has developed a new tool that makes synthetic biology easier and more accessible than ever for any lab. Sequence information is always secure and confidential at IDT. Non-disclosure agreements are available through IDT's legal services upon request. gBlocks Gene Fragments are available in lengths from 125–2000 bp. gBlocks Gene Fragments are delivered dry, normalized to 1 ug. Shipped within 4–7 business days—the time it takes to synthesize a gBlocks fragment is dependent on length and complexity. Lucigen has a wide variety of cloning systems, including novel transcription-free cloning vectors, that improve cloning yields, reduce cloning bias, and improve sequencing throughput. For cloning the most difficult sequences, the BigEasy® v2.0 Linear Cloning System offers unmatched stability. Most Lucigen cloning vectors are pre-cut, dephosphorylated, and ready-to-use. Competent Cells include Control DNA and Recovery Medium, and are packaged as SOLOs (1 transformation per tube), DUOs (2 transformations per tube), Subcloning Grade (12 transformations per tube), or microplates as indicated. Recovery Medium is also available separately. The specified transformation efficiencies are with pUC DNA, unless indicated otherwise. E. cloni 10G Competent Cells. Library construction, Routine cloning, subcloning, and plasmid isolation with or without blue/white screening. E. cloni 10G Chemically Competent Cells (> 1 x 109 cfu/µg pUC DNA; (> 1 x 108 in 96-well plates). Highly efficient competent cells for routine cloning applications. Available in one transformation per tube (SOLOs) or two transformations per tube (DUOs). Also available in 96-well plates (which can be divided into 24-well seqments) for higher throughput. E. cloni 10GF' Chemically Competent Cells (> 5 x 108 cfu/µg pUC DNA). An excellent choice for producing single-stranded DNA for sequencing, mutagenesis, etc. SUPREME Cells have the highest transformation efficiency available from any supplier. Choose SUPREME Cells for the most demanding cloning situations, such as construction of large, high complexity libraries or cloning difficult targets, which require the greatest number of transformants possible. ELITE Cells have twice the transformation efficiency compared to “ultra high efficiency” cells from other suppliers. ELITE Cells provide large numbers of transformants from hard-to-clone fragments or limited DNA at a lower price. CLASSIC Cells are high efficiency cells with a substantially lower cost per reaction. These cells are the most economical choice for standard cloning and library construction. 10G CLASSIC Cells are available in larger package sizes for convenient use in higher volume cloning applications. Useful for routine cloning, subcloning, and plasmid isolation with or without blue/white screening. The highest efficiency TG1 competent cells available: >4 x 1010 cfu/µg. TG1 Electrocompetent Cells. An amber suppressor strain (supE) prepared as highly efficient (>4 x 1010 cfu/µg) electrocompetent cells for phage display library screening. These cells are used for phage display and protein expression. SS320 Electrocompetent Cells. A non-amber suppressor strain (sometimes called MC1061F') prepared as highly efficient (>4 x 1010 cfu/µg) electrocompetent cells for phage display library screening. These cells have the highest available transformation efficiency of any strain used for phage display. MC1061 F- Electrocompetent Cells. A non-amber suppressor strain, identical to SS320 except that it lacks the F'episome. Highly efficient (>4 x 1010 cfu/µg) electrocompetent cells for general cloning or Phage Display. Note that as an F- strain, it cannot be used for re-infection by filamentous phage. This strain not included in the sample kit. ER2738 Electrocompetent Cells. An amber suppressor strain (glnV) prepared as highly efficient (>2 x 1010 cfu/µg) electrocompetent cells for phage display library screening. This strain is recommended for use with New England Biolab's Ph.D.™ Phage Display Kits. Cells that enable the most challenging library construction and screening. Highest available transformation efficiencies for library construction and screening. Optimized for high yields of DNA. BAC-Optimized Replicator™ v2.0 Electrocompetent Cells (> 2 x 1010 cfu/µg pKanR DNA). These cells are required for on-demand, copy number amplification of the pSMART® BAC or pEZ™ BAC vectors in the CopyRight® Kits, thereby increasing DNA yields. BAC-Optimized Replicator Cells are components of Lucigen’s CopyRight® Cloning Kits. Cells required for transformation and propagation of pJAZZ® Vectors. Ideal genotype and efficiency for Kunkel directed mutagenesis method1. Effective in expressing toxic & membrane proteins from all classes of organisms, including eubacteria, yeasts, plants, viruses, and mammals. The strain C43(DE3) was derived from C41(DE3) by selecting for resistance to a different toxic protein and can express a different set of toxic proteins to C41(DE3). pLysS are lysogens of λDE3. These strains carry a chromosomal copy of the T7 RNA Polymerase gene under the control of the lacUV5 promoter. These strains are suitable for production of protein from target genes cloned into T7-driven expression vectors. Eliminates the need for plasmid transfer from the cloning strain to the expression strain, saving days of work in a typical cloning and expression experiment. Phage T7 RNA polymerase gene linked to the IPTG-inducible promoter, for use with any expression plasmid containing the T7 promoter. pLysS Electrocompetent Cells (> 2 x 108 cfu/µg) produce T7 lysozyme to repress low-level transcription from the T7 promoter prior to IPTG induction, helping to stabilize inserts coding for deleterious products. pLysE Electrocompetent Cells > 2 x 108 cfu/µg) have a higher level of repression by T7 lysozyme, offering the greatest control over expression of inserts. Biotin XCell™ F’ cells are based on the MC1061 strain, but have had the birA gene integrated into the genome. The BirA protein (biotin ligase), which is induced with the addition of arabinose, will facilitate the addition of a biotin molecule to proteins bearing the appropriate signal sequence (AviTag). Efficient in vivo biotinylation of target protein. High efficiency electrocomp cells. The HI-Control™ strains are based on the popular E. cloni 10G (same as DH10B) and BL21(DE3) strains. They were created by adding a plasmid bearing a constitutive lacI gene, which provides tight control over promoters containing the lacO operator. Both 10G and BL21(DE3)-based strains are noted for their ability to express high levels of protein. OriGene is licensed to provide lentiviral vectors and related products. 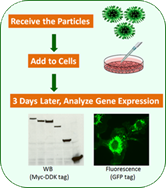 Both shRNA and ORF lentiviral particles are offered!